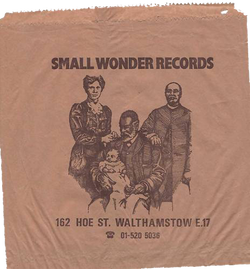 Small Wonder Records was a UK independent record label owned and managed by Pete Stennett, that specialised in releasing records by punk rock and post-punk bands. It operated out of a record shop of the same name at 162 Hoe Street, Walthamstow, E17, east London. Important artists to have released on the label include Bauhaus, Crass, The Cure, Patrik Fitzgerald, Puncture, Cockney Rejects, Poison Girls and the Angelic Upstarts. I lived in Walthamstow in the early '80's, and used to go to Small Wonder every Saturday. I was 12/13 at the time, and initially found it somewhat intimidating. I used to buy things (restricted finances permitting) that i'd heard on John Peel's show, listening with a single earphone under the bedcovers. Very 1950's. The staff were great, very friendly towards the weird kid buying a Blue Orchids single. It introduced me to great music and helped make me the music snob i am. Kidding. Not really kidding.Ah, innocent times. Comment Mark Hudson. I must have gone in there a couple of times when I lived in South Chingford. Would have been `86/`87 and I think it must have closed not long after. Bought a S/H copy of I Roy's 'Many Moods of I Roy' on Trojan which I still have. Back in the `70s I'd bought a Carpettes 45 on Small Wonder from Cloakes in Streatham. Comment: Mark Griffiths. (Aug 18, 2014) Vince said:I lived in Chingford in the late 70's, early 80's and apart from a trip to Virgin Records in Oxford Street this was the only place you could buy anything punk. And yes, Mark Hudson, boy was it intimidating. Pete Stennett would openly mock you in the shop if you tried to purchase anything he didn't like (conveniently overlooking the fact that he had stocked it in the first place) and if you tried to return a record he would shout "its not a lovein library you know..." But still I loved it and its a real shame Pete moved on. (August 13, 2015) SMALL WONDER WILL ALLWAYS MEAN TO ME THE BEST RECORD SHOP I EVER SPENT MY POCKET MONEY IN. I DONT KNOW IF ANY OF MY SCHOOL MATES WHO USED TO BUY THEIR 45 and Lps in their Would like to Email me!! IT would be nice to relive the good ole days of SMALL WONDER records. THANK YOU SMALL WONDER FOR MAKING MY SCHOOL DAYS IN GEORGE MITCHELL, LEYTON COUNTY HIGHT ESSEX ROAD SO FANTASTIC!!! Comment: Martin English. (October 05, 2015) Small Wonder was such a wonderful adventure for a 15-year-old kid. 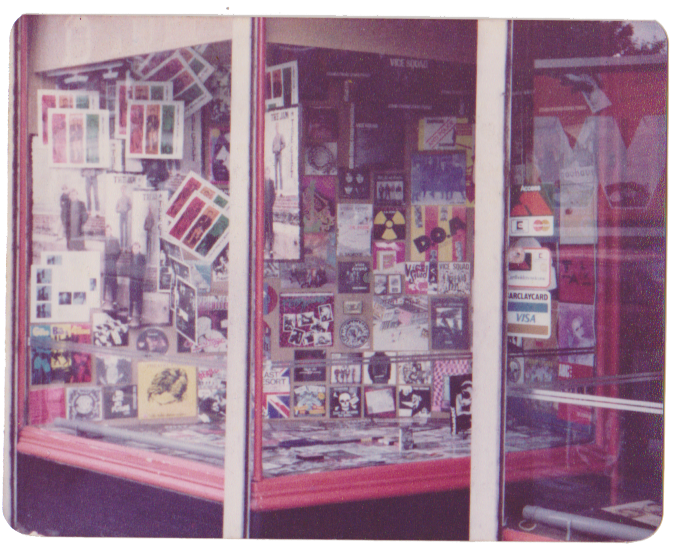 Having missed the initial punk explosion, I managed to get the almost entire back catalogue of Pistols, Clash, Adverts, Generation X, X-Ray Spex, Slits from Petes returns shelves in the centre of the store. Used to go in there at first knowing he'd rip the piss out of you , but eventually you got used to it and he turned out to be a diamond. Even my Mum ventured in there to get me the first Killing Joke album for Xmas. If I have any memories my best would be Pete coming over to me in the corner by the 2nd hand albums one afternoon to tell me Crass were playing at Markhouse Rd Youth Centre with the Poison Girls. great gig and eternally grateful he lowered himself to talk to me!! The other was getting my first bass from the notice board by the door as you came in. I stayed with it and ended up in bands of my own , one of which was called The Small Wonders as a tribute to where my musical tatse stemmed from. (October 17, 2015) I used to live in NZ, I used to get all my records I couldn't get from Small Wonder. Killing Joke, The Fall, Mekons ....... found them advertising in the back of NME which we used to get 6 weeks after it was released in the UK!) Comment: Paul Fogarty. ( December 19, 2015) Wow, such memories, is the photo bottom left of Pete now? I grew up in Stoke-on-Trent and used to buy loads of stuff mail order from Small Wonder. I thought the catalogue (still have a couple) was great and Mari used to write personal replies on them when sending single out in the mail. So when I went to Uni in London in 1981 it was the first records shop I went to. Fondly remember calling in one day to find nobody in the shop. After 3 or 4 minutes Mari came in the from the back room and was surprised to see me alone in the shop. "Where's Pete" she asked? I shrugged; at that time I didn't know who 'Pete' was as it was only Mari who wrote back with the mail orders. Just then in walks Pete from the street and an almighty row broke out - something about 'not tellin me you left the shop' and 'how was I suppoed to know you hadnt locked up' and 'customers walking in all alone in the bl**dy' shop'. On another occasion, Pete and me were trying to recreate the machine gun drum machine beat of Second Layer's 'Courts or Wars' with a plastic ruler on the counter top. What a guy. I didnt know about the picture that became the label coming from under the floorboards - brilliant. Comment: Steve Tilsley.